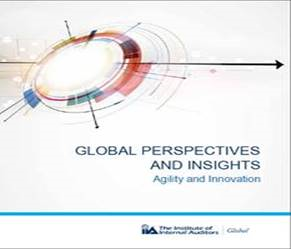 The newest issue in the IIA’s Global Perspectives and Insights series Agility and Innovation defines what it means to be agile and innovative in today’s marketplace and how the two are interdependent. The report highlights how to identify the issue from multiple fronts, discussing everything from the shift in mindset to the mix of talent and technology that is necessary to get the job done. Agility and Innovation hits on key areas that are critical for internal audit functions to master — such as strong data management and data analytics — and discusses areas where artificial intelligence and process automation can be leveraged to allow practitioners to spend their time on more value-added activities. To assist internal auditors with getting on the path to agility and innovation, the report concludes with five steps they can take now to put the wheels in motion.